The beginning of the women’s movement in the second half of the nineteenth century saw the increasing involvement of women in social life, politics, and literature. More than that, however, it also saw some emancipated women adopt “male” clothing and habits, such as smoking. That such “unfeminine” behavior roused critics can be seen in this caricature, which shows a male smoker asking a couple for a light. 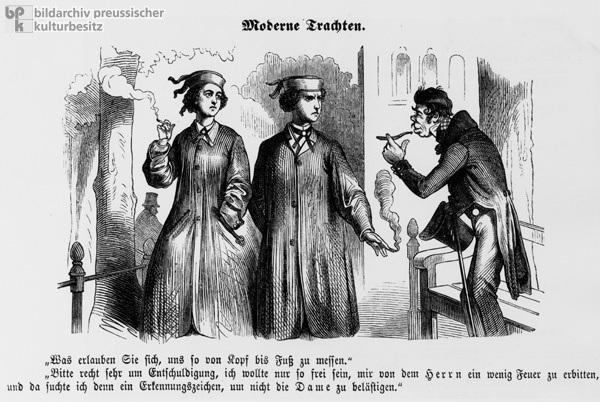 Both the man and the woman are smoking, and the two are dressed similarly in masculine attire. The dialog unfolds as follows: (the couple) “How dare you size us up like this from head to toe?” The male smoker: “Begging your pardon, but I merely wanted to take the liberty of asking the gentleman for a light, so I was looking for a distinguishing mark in order not to trouble the lady.” Wood engraving by unknown artist, 1862.